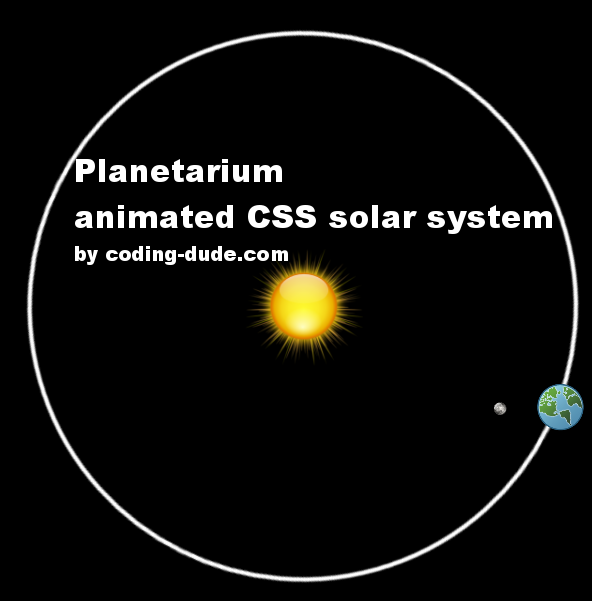 In this post I will show you how to create a so called planetarium CSS solar system. Basically I will use CSS animations to animate a representation of our solar system. Actually I will only represent the movement of the Moon around the Earth, the rotation of the Earth around its own axis and the revolution of the Earth around the Sun. If you have not used CSS animation so far, I suggest first reading the 5 min CSS animation beginner tutorial and then coming back to this. See the Pen CSS Planetarium – solar system with CSS animations by Ion Emil Negoita (@inegoita) on CodePen. I tried to make this Planetarium accurate from the timing point of view. I cannot make it accurate from the scale point of view since the Sun is huge in comparison to the Earth and you would not be able to see it properly. Since the size of the solar system div is 800 x 800, I had to move the Sun first by 400 x 400 and then to pull it back by 60px which is actually half of the 120px size of the Sun. I indicate a @keyframes animation called earth-rotation via the animation CSS attribute. I scaled the time line such that 1 second represents roughly one day, so since the Earth takes one day to rotate around its axis, the rotation animation duration is set to 1 second. Also, I indicate that the animation should be repeated in a loop via the infinite value, and the transition between states of the animation should be linear. Let’s take a short look at the @keyframes animation itself. It’s pretty self explanatory saying that at 100% of one complete look it should have rotated the element by 360 degrees. The minus just indicates that the rotation should be counter clockwise, which hopefully is correct, “planetologically” speaking. So, since the duration of the animation is 1 second, it means that every second the element will be fully rotated around its axis. The earth-orbit div spans the full size of our solar system div to allow the Earth to rotate fully around the center – the Sun. The @keyframes animation for earth-revolution is identical to the earth-rotation. 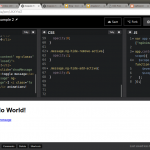 There is a difference though in the CSS class earth-orbit. I’ve made the duration of the revolution animation 365 seconds for the 365 days in a year, consistent with the 1 day = 1 second assumption made for the other elements. The @keyframes CSS animation for the Moon rotation is also similar to the other animations. The difference is that since we want the Moon to rotate around the Earth we have to first translate the Moon to the same spot as the Earth which is 400px down and 100px to the left plus half of the Earth’s size (25px) for the exact center. Then, we need to move the Moon on it’s orbit which I set to 50px. Also, we need to move the transform origin by 50px using transform-origin:50px 50px. This will make the Moon rotate around the exact center of the Earth, and not its own center. The duration for the animation is 27.3s, equivalent to the 27 days and 7 hours (.3 seconds means a third of a day) it takes the Moon for a complete rotation around the Earth. 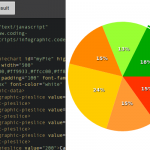 That sums up this post on how I created a fully working animated CSS solar system. I hope you enjoyed this and if you did please make sure you share this.